It’s date night, and it’s your turn to choose the food, drinks, and entertainment. You remember all of this around 3:30, when you get a text from your partner asking where you’ll be meeting. You know they’ll want Thai, so you respond, telling them to meet at Twist on Thai. But — plot twist — they want to stay in, and you wanted to go out. So you compromise with Thai takeout. However, you’re still looking for something more than a low-key night in. To try something new, you decided to get a build-your-own six pack from your neighborhood store. . . but, once inside, you start to wonder which beers would go best with your food. . . but, you haven’t looked at the menu. Lucky for you, we’ve got the mobile version here. 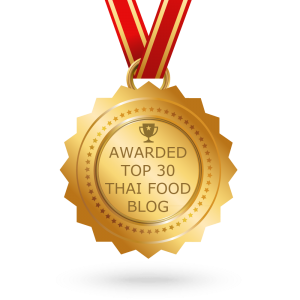 And, going forward in the blog, we’ll give you our take on which ales pair best with our signature Twist on Thai appetizers, soups, salads, entrees, and desserts. Por Pia Pak, our light, crispy spring rolls are stuffed with cabbage, carrots, and glass noodles, and finished off with a side of sweet sauce. Made to share, these crispy rolls offer a lot of flavor in a compact space. This means you probably don’t want a beer that’s going to distort or drown out the spring rolls’ flavor. An equally light, crisp lager to match is what we’re looking for. And that’s not too hard to find in the States. 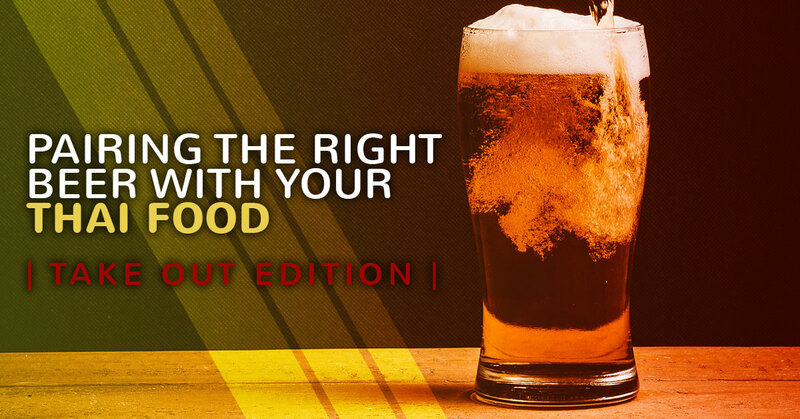 But this doesn’t mean it has to be bland or taste like a dirty nickel took a bath in your beer. There are a ton of delicious light lagers out there right now, brewed with ingredients such as lemongrass, ginger, and tropical fruits — all of which go great with the ingredients we use in our por pia pak. To both clear and prime your palate, make sure you grab our som tum goong sod. This Thai salad gets a burst of flavor from the generous amount of fresh papaya, cherry tomatoes, carrots, and long green beans. With its complimentary Thai lime dressing, this salad isn’t going to leave you wanting. And we get that it might sound strange to try and pair a beer with a Thai salad, but hear us out. It’d be easy to overpower the salad’s flavors, but if you stick to a lighter beer with just a bit of hop backbone, you’ll be good. Even though we’re on the opposite side of the country, west coast pale ales have been known to make their way to Hopatcong. These hoppy pale ales generally offer a good malt-hop balance, meaning that, while you’ll get some of the bitterness from the hops, the malt balances it out as an excellent complement to the papaya’s sweetness. Soup and Some . . . Scotch? Not quite, but sort of. We’re talking about Scotch ales. These copper- and brown-hued ales are sweeter than their relative, the Scottish ale, making them the perfect pairing for our Tom Kha. This rich soup made of creamy coconut milk, onions, bell peppers, mushrooms, and galangal (sometimes caught moonlighting as Siamese ginger). If you’re still scratching your head on how a Scotch ale and coconut soup pair well, we’ve got you: the Scotch ale’s sweetness is what makes it perfect for pairing; coconut milk is a rich, sweet milk, but doesn’t have a richly sweet taste. And, while Scotch ales aren’t known for their in-your-face hops, the hops make themselves known enough to go well with the slight spice of the galangal. Like we said, we know this pairing sounds odd, but give it a go; we’re sure you’ll be pleasantly surprised. Honorable Mention: Low ABV/session imperial pales ales are a good choice for drinking while enjoying our Tom Kha. Some might find this beer style’s hop-forward flavor a bit much for the satiny smoothness of the coconut milk, but the spice and earthiness from the galangal step up once again to all but quell the hops’ aggressive flavor. Maybe the most famous styles of the American craft beer boom of the last two decades, the India pale ale — or, IPA, as it’s most commonly known — houses more hop flavor than any other style. It’s an intense, often overly bitter (in the best way possible) experience. So, what goes with such a tastebud-overloading beer? An equally rich and robust meal, of course. And that’s exactly what our signature spicy bamboo duck delivers. Starting with tender slices of stir-fried duck, this Twist on Thai creation is full of flavor bursts from the generously portioned vegetables that bob about the dish’s spicy red curry — all atop perfectly portioned Jasmine white rice. No one star shines in this dish more than the duck. With its uniquely rich flavor and the red curry’s savory-spicy blend, the imperial pale ale’s hops work wonders to balance everything out while intensifying the pairing’s unique blend of flavors. One of our favorite signature dishes to pair with an IPA is maybe our most unique creation. Our Thai tacos take the Thai flavors you know and love and perfectly merge them with the tastes our neighbors to the south gave to the world. Our Thai tacos come stuffed with your choice of spicy ground beef or diced tofu, all slowly simmered in a broth rich with jalapeños, onions, garlic, sweet Thai basil, and topped with shredded cheese, all firmly secured in four crispy taco shells. Completed with spicy rice, our Thai tacos have enough spice and heat to enliven your tastebuds. When paired with a super-hoppy IPA, the mix gets intensely delicious. Twist on Thai Pro Tip: If you spot an IPA boasting citrus flavor, whether from citrus hops or the addition of citrus fruits, do yourself a favor and grab that one. We’ve already covered the hops’ roll in this pairing, but the addition of citrusy fruits adds a whole new dimension to the flavor fusion. No Thai meal is complete without ending on a sweet note. And when you think of dessert and Thai food, ice cream may not be the first thing that springs to mind, let alone beer. But there’s a lot of opportunity for flavor exploration when you pair the right beer with the right ice cream, like our coconut dream and any stout variety. Just like the Tom Kha soup we mentioned earlier, the coconut’s rich and sweet flavor is best experienced with an equally rich flavor and some bitterness to offset that sweetness. Stouts, the darkest of beer styles, offer a wide variety of tastes, ranging from dry and bitter to full-bodied and sweet. We prefer to take our coconut ice cream with a sweet stout, one with a bit of a bite, but with enough sweetness to round out the whole meal. But, when we’re looking for a richer experience, our Thai coffee ice cream does the trick — especially when eaten alongside a dry Irish stout. Whichever you choose, there’s no bad way to pair your ice cream with a stout. Twist on Thai Pro Tip: No matter your ice cream decision, drop the dollops into a freshly poured pint of your favorite stout for an adult milkshake that’s nothing short of a decadent swirl of stout and sweetness. Whether you’re sampling our soups or ordering a feast for two, Twist on Thai has you covered for the best Thai dishes to pair with your favorite beers. Give us a call at 973-755-6305 to place your order or contact us via our online contact form with any questions or comments.